Cash Money! 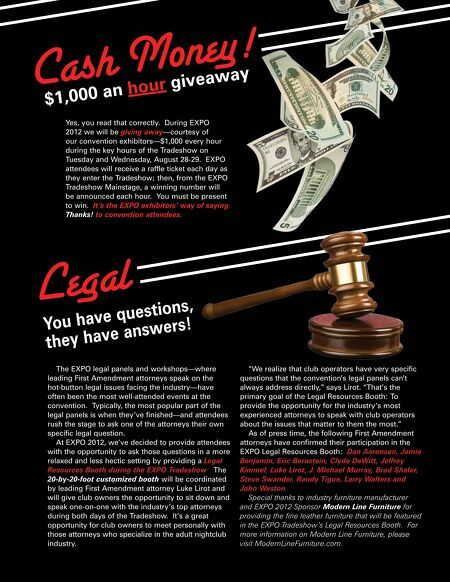 $1,000 an hour giveaway Legal You have questions, they have answers! Yes, you read that correctly. During EXPO 2012 we will be giving away—courtesy of our convention exhibitors—$1,000 every hour during the key hours of the Tradeshow on Tuesday and Wednesday, August 28-29. EXPO attendees will receive a raffle ticket each day as they enter the Tradeshow; then, from the EXPO Tradeshow Mainstage, a winning number will be announced each hour. You must be present to win. It's the EXPO exhibitors' way of saying Thanks! to convention attendees. The EXPO legal panels and workshops—where leading First Amendment attorneys speak on the hot-button legal issues facing the industry—have often been the most well-attended events at the convention. Typically, the most popular part of the legal panels is when they've finished—and attendees rush the stage to ask one of the attorneys their own specific legal question. At EXPO 2012, we've decided to provide attendees with the opportunity to ask those questions in a more relaxed and less hectic setting by providing a Legal Resources Booth during the EXPO Tradeshow. The 20-by-20-foot customized booth will be coordinated by leading First Amendment attorney Luke Lirot and will give club owners the opportunity to sit down and speak one-on-one with the industry's top attorneys during both days of the Tradeshow. It's a great opportunity for club owners to meet personally with those attorneys who specialize in the adult nightclub industry. "We realize that club operators have very specific questions that the convention's legal panels can't always address directly," says Lirot. "That's the primary goal of the Legal Resources Booth: To provide the opportunity for the industry's most experienced attorneys to speak with club operators about the issues that matter to them the most." As of press time, the following First Amendment attorneys have confirmed their participation in the EXPO Legal Resources Booth: Dan Aaronson, Jamie Benjamin, Eric Bernstein, Clyde DeWitt, Jeffrey Kimmel, Luke Lirot, J. Michael Murray, Brad Shafer, Steve Swander, Randy Tigue, Larry Walters and John Weston. Special thanks to industry furniture manufacturer and EXPO 2012 Sponsor Modern Line Furniture for providing the fine leather furniture that will be featured in the EXPO Tradeshow's Legal Resources Booth. For more information on Modern Line Furniture, please visit ModernLineFurniture.com.